In line with the current series of download releases (Park+Murray (Cork, 07–29–10), Jin-Park-Weeter (Cork, 01-24-11), Park-Schroeder (Cork, 03-26-09) and Sikora-Smith-Park (Cork, 04–04–11)), this record is hosted at Bandcamp, and available as a ‘name your price’ album. Although you can download the recording for free (name €0 as your price) with certain restrictions, please consider paying at least the recommended price. Your generosity will help support the performers and their work. Special thanks to Randy McKean for organizing the tour, Ken Schumacher of Live Vibes Recording for the engineering, and to Corey Mwamba for feedback during the mastering process. 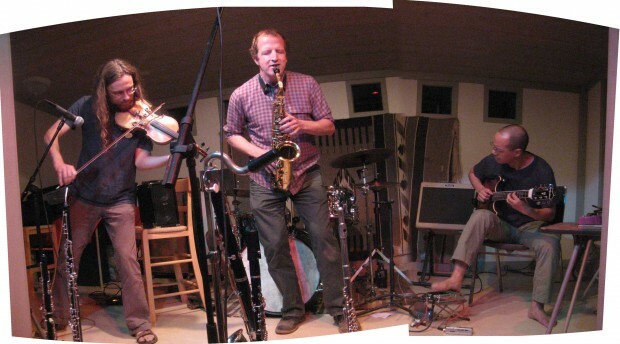 Gargantius Effect +1: Murray Campbell, Randy McKean and Han-earl Park (The Tin House, Grass Valley, August 25, 2011). Photo © 2011 Ken Schumacher. In front of a small but appreciative audience, the California-based Gargantius Effect, including [Han-earl] Park, Murray Campbell, Randy McKean, Scott Looney and Gino Robair, slip in and out of something approaching Webern-ian counterpoint on Nor Cal 8-2011. 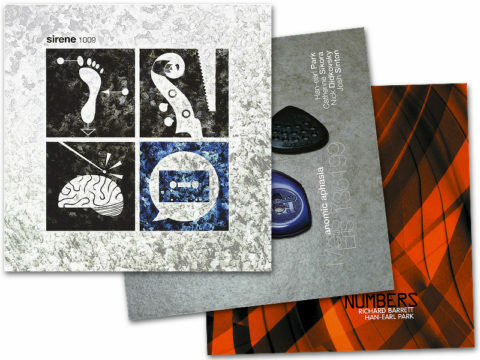 Looney and Robair join in later on this disc of various tour dates, leaving the other three to explore the outer limits of timbre, especially on the epic “Old Robots Never Rust”. Campbell’s violin slides are an excellent foil to the more vocal qualities in Park’s improvising, not to mention similar devices used by multi-reedist Randy McKean as the trio converge and diverge in pitch space. When Robair and Looney appear, electronics and hyperpiano are difficult to distinguish, but first-rate audio keeps everything in proper perspective and the improv is always edge-of-seat energetic. “Han [Han-earl Park] is a very old friend of mine. We’ve done a lot of strange things in various parts of Europe. He’s somewhat responsible for me ending up in Nevada County. About ten years ago he was studying at CalArts, and I came over to play in his graduation show. Part of that trip was my first visit to Nevada County, where many things spinned out from that. 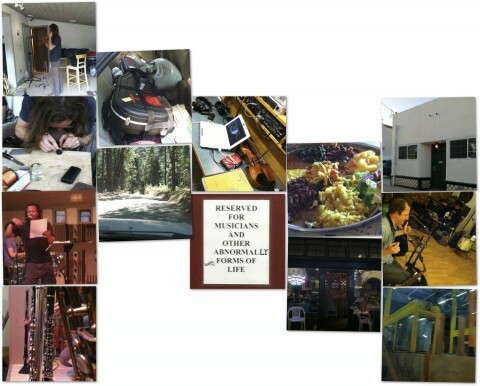 “Also finding this gentleman [Randy McKean] here in Grass Valley; finding not only a great improvising player, but one that plays bass clarinet, was a huge thing that helped me stay. It was a complete leap in the dark to move out here. I was raised in a rural area, I always known that that was the thing to do, but leaving a metropolitan zone [The Hague] and coming out here with nothing—no plan—was a shot in the dark, and finding that there were things like this [McKean] in the woods made it a lot easier to stay. The Gargantius Effect is the brainchild of Murray Campbell (violins, oboe and cor anglais) and Randy McKean (saxophone, clarinets and flutes). Like the Stanislaw Lem story of the same name, in which armies of warring soldiers are linked together to form a peaceful, blissfully-aware omni-mind, so, too, these longtime collaborators and Nevada County natives transform the connections and crossfires of the various genres in which they usually find themselves—the Euro-café of Beacoup Chapeaux, Balkan swing of Chickenbonz, chamber jazz of Bristle—into scintillating bits of free improvisation, compositional constructs and mechanized mayhem. This album documents Gargantius Effect’s August 2011 tour of Northern California with special guest and fellow Sonologist Han-earl Park (guitar), who had just returned to the States after years in Europe, teaching, and playing with the likes of Paul Dunmall, Charles Hayward and Franziska Schroeder. In addition to the recording of the performance at The Tin House (Grass Valley) on August 25, 2011, the August 30, 2011 session at Studio 1510 (Oakland) features Bay Area veteran improviser, composer and electronic artist Gino Robair (energized surfaces, voltage made audible), and hyperpianist Scott R. Looney (hyperpiano). 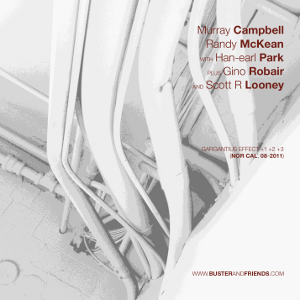 Murray Campbell (violins, oboe and cor anglais), Randy McKean (saxophone, clarinets and flutes) with Han-earl Park (guitar), plus Gino Robair (energized surfaces, voltage made audible) and Scott R. Looney (hyperpiano). The First Sally (22:25), Old Robots Never Rust! (10:54), Thunderous Accompaniment of Fife and Drum (22:12), While Drums Continued To Roll (17:30). Total duration: 73:01. All music by Murray Campbell, Randy McKean and Han-earl Park, except ‘Thunderous Accompaniment’ by Murray Campbell, Randy McKean, Han-earl Park and Gino Robair, and ‘While Drums’ by Murray Campbell, Scott R. Looney, Randy McKean, Han-earl Park and Gino Robair. ‘The First Sally’ and ‘Old Robots’ recorded live August 25, 2011 at The Tin House, Grass Valley. Performance presented as part of Col. MaCaw’s Magical Cure-All Mid-Summer Soporific. Recorded and mastered by Ken Schumacher. ‘Thunderous Accompaniment’ and ‘While Drums’ recorded live August 30, 2011 at Studio 1510, Oakland. The recordings (The First Sally, Old Robots Never Rust!, Thunderous Accompaniment of Fife and Drum, and While Drums Continued To Roll) and artwork released under a Creative Commons Attribution-Noncommercial-No Derivative Works 3.0 Unported License. 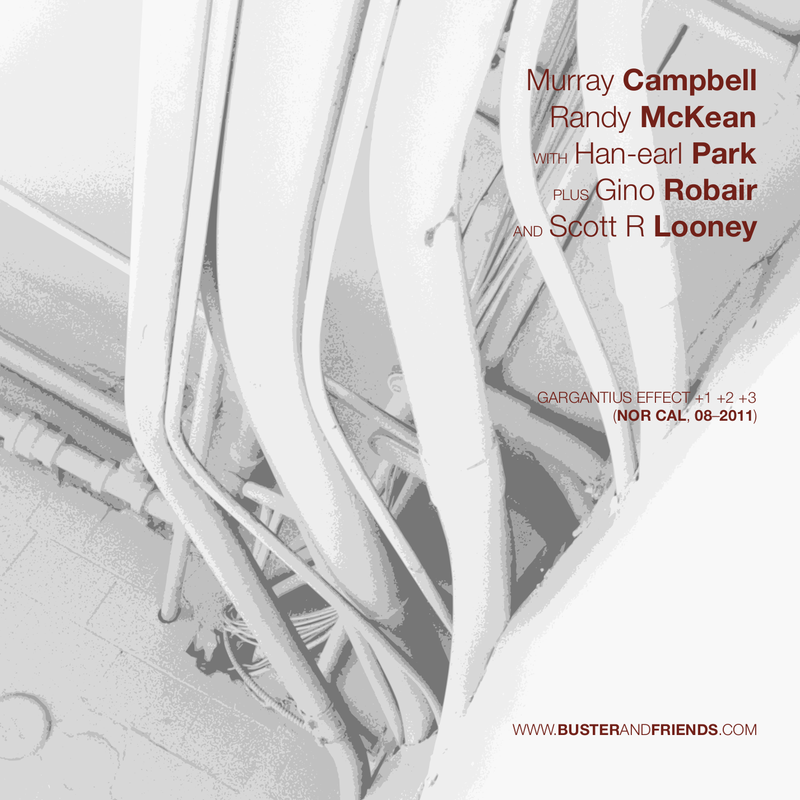 Please attribute the album to Murray Campbell, Randy McKean, Han-earl Park, Gino Robair and Scott R. Looney; attribute the individual tracks to the corresponding performers; and attribute the artwork to Han-earl Park. The Gargantius Effect is the brainchild of Murray Campbell (violin, oboe and electronics) and Randy McKean (reeds). Like the Stanislaw Lem story of the same name, in which armies of warring soldiers are linked together to form a peaceful, blissfully-aware omni-mind, so, too, these long-time collaborators channel their contrarian impulses into synchronized bouts of free improvisation, compositional constructs and mechanized mayhem. Murray Campbell has described himself as a Sonologist ever since it was recommended to him as a more respectable occupation than “musician” for the purposes of immigration control. In this capacity he has worked with Alex Fiennes on an octaphonic spatialisation system un-muted at Dialogues Festival (Edinburgh). He currently resides in the foothills of the Sierra Nevada mountains in California where he is designing an off-grid solar-powered geodesic wavefront recreation system with the aim of upsetting the bears. He finds writing about himself in the third person slightly disturbing. Randy McKean has burrowed into the foothills of the Sierra Nevada but still wants to blow your mind. Whether his mission is executed by his chamber jazz quartet Bristle, through sideman gigs with the likes of the Euro Café messabouts Beaucoup Chapeaux, or via performances of his pieces for orchestra or string quartet, matters not to him, as long as his objective is achieved. Perhaps one of his CDs—Bristle’s Bulletproof (Edgetone), So Dig This Big Crux (Rastascan), or the Great Circle Saxophone Quartet’s Child King Dictator Fool (New World)—will do the job. Robair is also one of the “25 innovative percussionists” included in the book Percussion Profiles (SoundWorld, 2001). He has recorded with Tom Waits, Anthony Braxton, Terry Riley, Lou Harrison, John Butcher, Derek Bailey, Peter Kowald, Otomo Yoshihide, the ROVA Saxophone Quartet, and Eugene Chadbourne, among many others. In addition, Robair has performed with John Zorn, Nina Hagen, Fred Frith, Eddie Prevost, Thinking Fellers Union Local 282, Myra Melford, Wadada Leo Smith, and the Club Foot Orchestra. Performers: Randy McKean (saxophone and clarinets), Cory Wright (saxophone, clarinets and flute), Murray Campbell (violins, oboe and cor anglais) and Lisa Mezzacappa (double bass). ℗ 2012 McKeanics Publishing, BMI/Corey Wright Publishing, ASCAP. 05–20–13: updated the ‘also available for download’ list, and updated reviews.